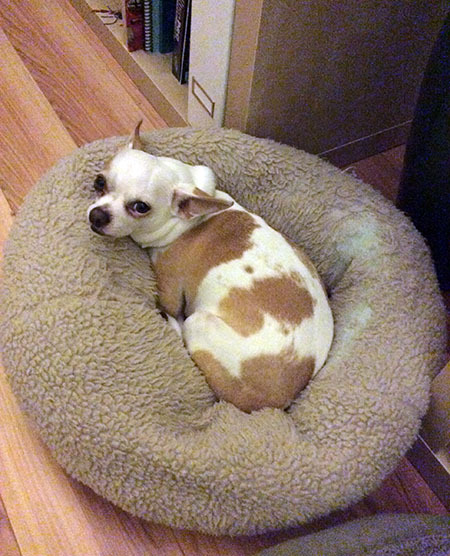 The week is chugging along here, sweet Miko was sitting in the office with me this morning waiting for something exciting like walk time. My exciting week-long wait for home fermented sauerkraut is over and now I have two huge bowls of probiotic garlic dill sauerkraut stashed in the fridge. I’m sad to say that I have not made time to do any fermenting in months, the planning just has not happened with so much else going on. And that’s pathetic when I have this gorgeous 5-liter TSM Fermenting Crock with weights. 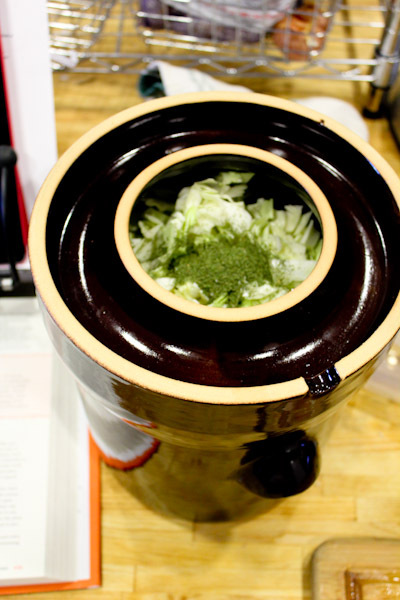 In an effort to incorporate more natural probiotics into our diets, I grabbed a huge head of organic cabbage, chopped it up, and stuffed into the crock with water, garlic, dill, and salt using a basic recipe from The Art Of Fermentation book. Maybe I should have chopped the cabbage smaller because I could barely stuff it all into the crock and get the weights in! Since this is the first batch I’ve done in awhile and it’s very hot here, I decided to let it ferment for just a week to see how strong it would come out. Before getting the crock, I used this jar fermentation method which was a little more tricky keeping the contents submerged in the liquid during fermentation without the fitted weights and gently releasing the pressure without fully opening the jar periodically during the fermenting process. The crock has a water seal that seals the contents off from outside contamination while allowing it to release pressure bubbling up through the water. Just check the water seal once a day to make sure it’s full and you’re good to go! I couldn’t wait to try a little mixed into a salad. It’s tangy with a nice dilly garlic flavor, but not super strong and versatile to mix into just about any salad. Good for my first batch in awhile, but I think I’ll dabble with fermenting a spicy batch longer next time. 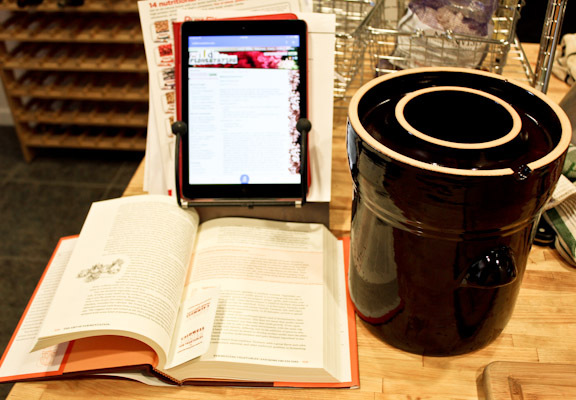 If you’re thinking about fermenting at home, this is an excellent crock kit with fitted weights to get started. 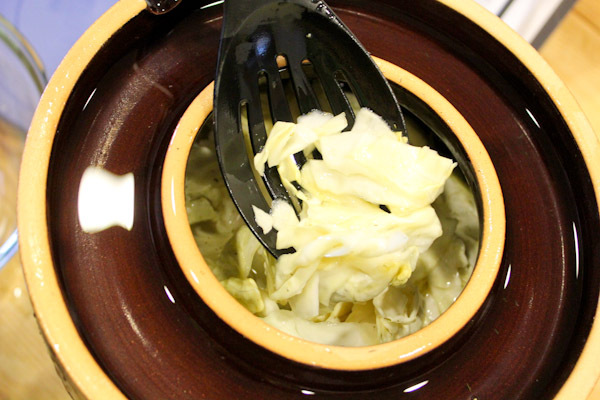 Fermented foods help by adding more diversity to our gut microbiome for happier digesting and absorbing nutrients. Eating a variety of plant foods also helps, Dr. Pam Popper gives more information in this video. 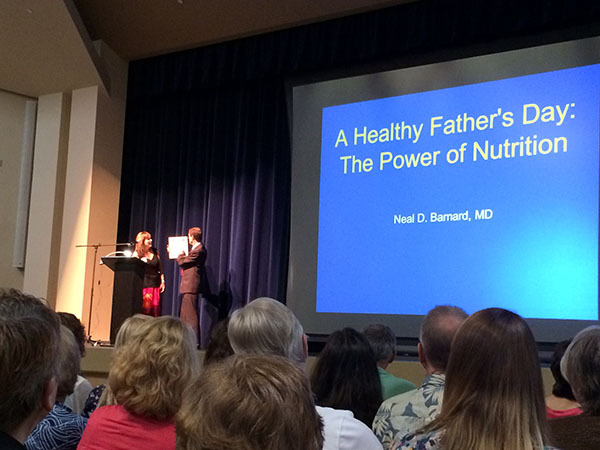 On Father’s Day, my mom and I headed into Sacramento for a presentation by Dr. Neal Barnard, a famous advocate for the plant based diet and founder of the Physicians Commitee for Responsible Medicine (PCRM). Back pain and erectile dysfunction are often caused by blood flow problems and early indicators of heart disease. Studies suggest that babies born to overweight and obese women actually have early symptoms of heart disease. The Dr. Atkins diet trend of fatty, low-carb foods is a bad thing for heart disease and diabetes with a lot of accompanying studies . He cited and illustrated studies suggesting that high-fat, low-fiber diets lead to a fat buildup in the cells disrupting insulin from regulating blood glucose. And also disrupts our metabolism’s “after burn” or ability to burn post meal calories. He cited interesting evidence that humans were never meant to be heavy meat eaters or even meat eaters at all such as the shape of our teeth, lack of hunting/meat eating instincts, and our vision is optimized for seeing the bright colors of ripe fruits and veggies. And heavy meat eating did not start until the stone ages when humans had tools for killing animals, separating meat, and cooking. He discussed the many benefits of a high fiber diet for loosing weight and helping the metabolism. Also studies suggest that a whole foods plant based diet is anti-inflammatory and beneficial for arthritis. He also discussed the extent the meat and dairy industries are going to to keep people buying their products such as influencing government nutritional recommendations on the Dietary Guidelines Advisory Committee and funding studies to benefit their products. Just start thinking about making a diet change for a week or so without making any changes, have fun identifying what you could eat instead for each meal. Then switch to a 100% plant-based diet for 21 days and focus on trying new, whole foods recipes during this time to help change your tastes and cravings. His view on whole fats, such as avocado and nuts, is they’re fine for everyone in moderation except those trying to loose weight and/or reverse type 2 diabetes. He also touched on vitamin B-12 requirements noting that it’s not actually in meats and animal products, but in bacteria that naturally grows on food. Also noting that a lot can interfere with our ability to absorb it such as medications. He thinks everyone over 50 should be taking a B-12 supplement and even earlier. He recommended vegans take a high quality supplement. He wrapped up the presentation with charts and data showing how things are slowly changing in the food industry and inspiring everyone to keep pushing for change and voting for change by supporting healthier, plant-based foods. If you’re interested and have 50 free minutes, here’s another great presentation by Dr. Neal Barnard. Dr. Neal Barnard is just making so many awesome points here and I totally am on board. One incentive for me for loosing weight before getting pregnant is definitely for the baby. I ate a pristine diet with my first born and she now is the healthiest eater even, she can barely even tolerate dessert and processed food. With my second, I was eating horrible and she has the worst sweet tooth. It just makes you wonder. And yes, I need the reminder to keep eating a high fiber diet! Thanks. I was really surprised about that study on pregnant women, wow! It makes sense, but pregnant women have enough to worry about already! That’s great on getting healthier for pregnancy and very interesting on past experiences. I love Dr. Barnard and quoted some of his studies at the wellness presentation I gave last week. I’d love to see him speak in person. That’s great on Dr. Barnard, thinking about his nutrition programs as well. Thanks on the pups, yours are adorable too! Dr. Neal – LOVE him! Wish I was able to hear him speak! 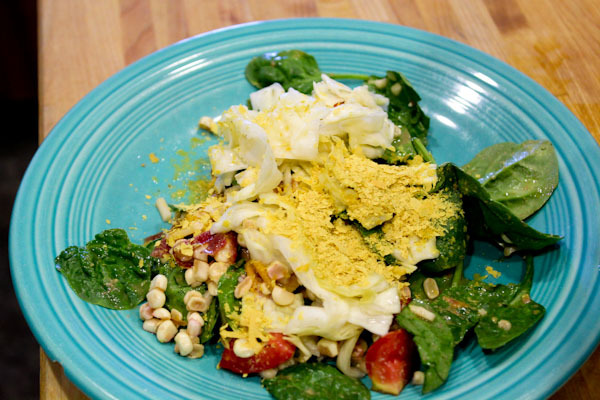 Fermenting is fun, I tried kefir water for awhile, but prefer fermenting foods much more for mixing into salads.